Enjoy Californian dining for Mothers Day at Big Sur in SOHO. 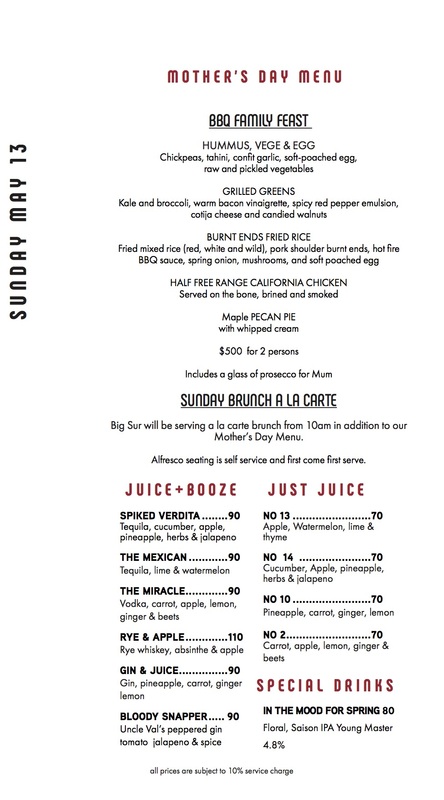 With fresh juices and a al carte brunch is an obvious choice for a low key lunch. If you’re in the mood to for a long lunch there’s a fresh vegetarian starters, followed up by our smoked free range chicken from California. Priced at only $500 for 2 adults – kids can choose from their own special kids’ menu or from a la carte brunch. Book your table here.